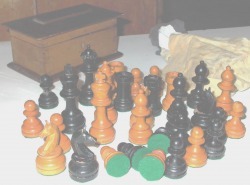 Loading a chess set is not difficult - if you have the appropriate equipment at hand. Which sets to load and for what reason, is something to decide beforehand - if the set is antique it is probably better to leave well alone. 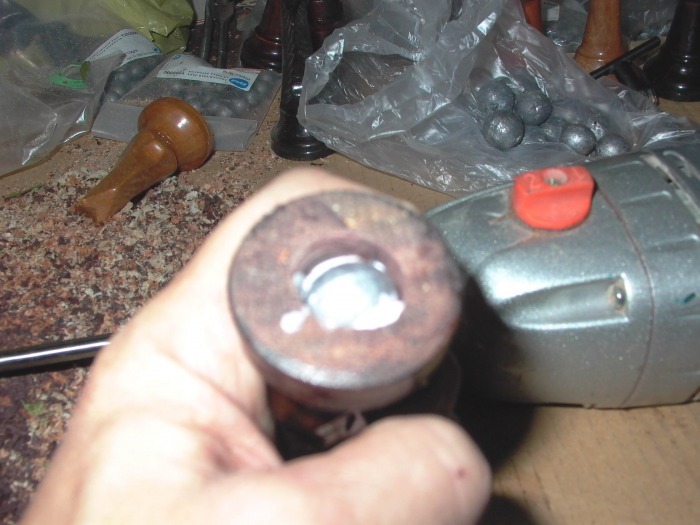 As perfection is difficult to achieve, I had to make do here with a large power drill, unsuitable drill heads, and round fishing weights - but these at least in standard weights. My procedure of placing the power drill onto the table, and pushing the pieces up against the rotating drill head is risky to say the least, imprecise and potentially self-mutilating - and can not be recommended. Here goes! 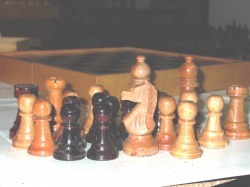 I start off with this large size nondescript set, in very dry exotic wood. The dark wood is noticeably tougher than the light wood - the set is nicely varnished, though. 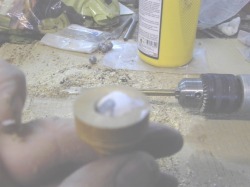 The drill bit I use produces a cylindrical aperture with a pointed center hole ahead- a round head would have been better for accomodating the lead balls, but - I cannot find roundhead wood drills that large around here! 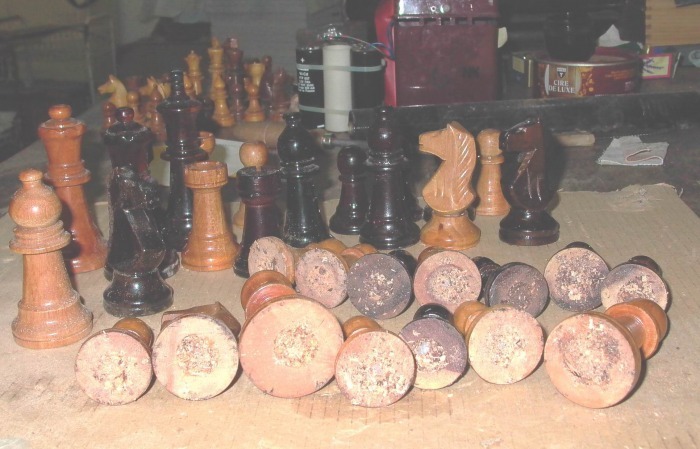 Also, this wood from Indonesia - like most well-dried chess pieces woods - is pretty tough to drill! 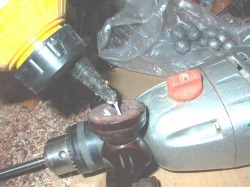 These drill bits are great for sinking a washer or a nut into building wood - not ideal for my task. Regard the pile of sawdust which will come in handy. 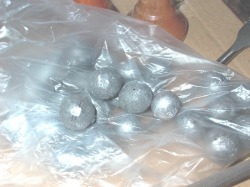 Lead balls in standard sizes with a hole through, to thread onto the fishing line - useful here as well. The problem with fishing weights is You need a large hole - and due to my drill bit a fairly deep one. There is a real danger of boring through the whole pieces - pawns for example - and right into my hand! 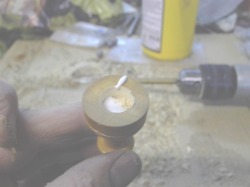 It is a good idea to measure the depth You want to drill to, and keep to it - see above, good equipment! .. tamp down some sawdust - preferably same kind of wood - on top of the lead ball, and let it dry. 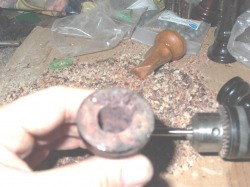 After drying even out the bottom with a sharp knife, to create a level surface for felting. Here is the bottom line - how the pieces look after leading, and before paring down the excess sawdust. Why sawdust? 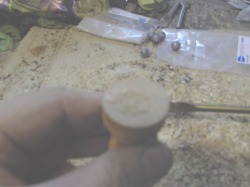 Sawdust with white glue forms a kind of rockhard wood cement, which is quite useful in wood construction for example. On this set - massive pieces king size 100 mm - I used 40 g weights on kings and queens, 30 g weights on the lighter pieces, and 20 g balls on the pawns. 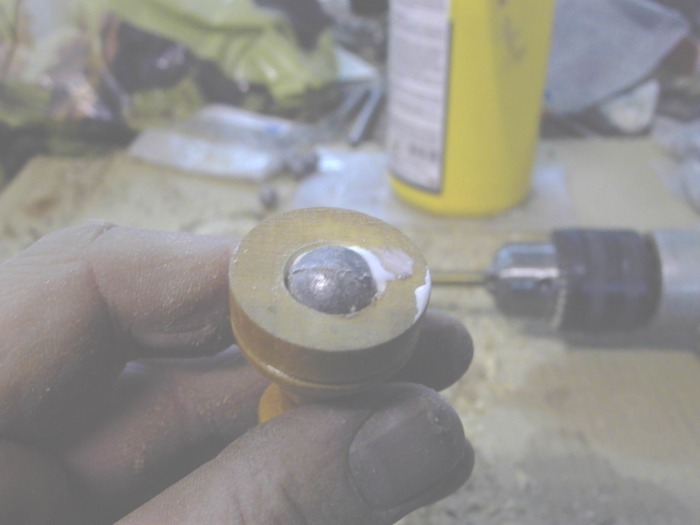 I repeat that having precut cylindrical weights - fe sections sawed off a lead stick - would be much better, as would be the use of proper drill heads and a vertically fixed drill. - let dry and then add felt pads. This is much easier, and will get good results as well. 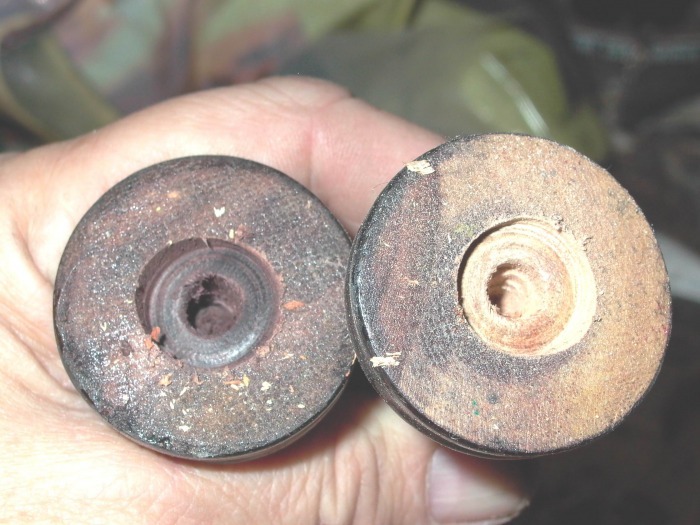 The problem lies in precise lead disks - washers are an alternative, although they usually do not provide sufficient weight. 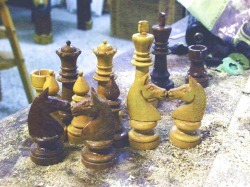 Pedestrian Staunton set of German origin, 98 mm king height, two piece knights. 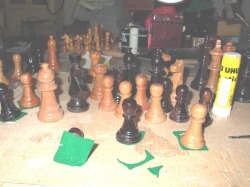 Here I use 30 g for kings and queens, 20 g for the major pieces and 10 g for the pawns. 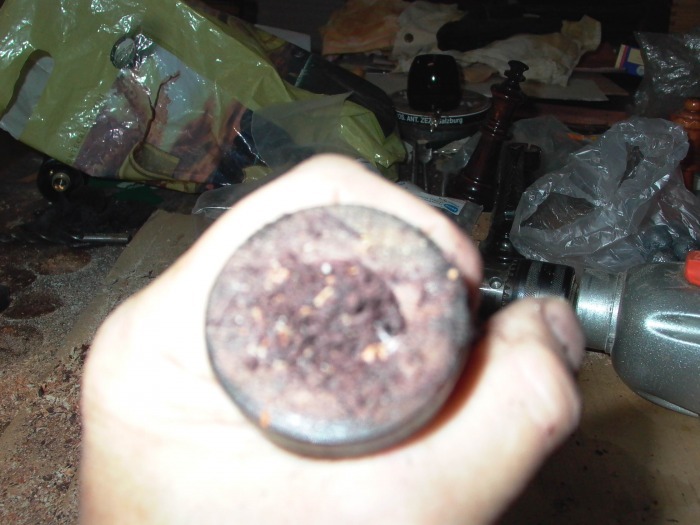 .. by tamping a liberal pinch of sawdust on top - preferably from these pieces - and let it dry. Later on, pare down the excess with a sharp blade, and prepare for felting, if need be with a touch of fine sandpaper. 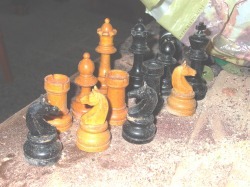 What justifies leading this set is only the sharpish form of knights, the rest is very drab. Maple wood natural and burnished. 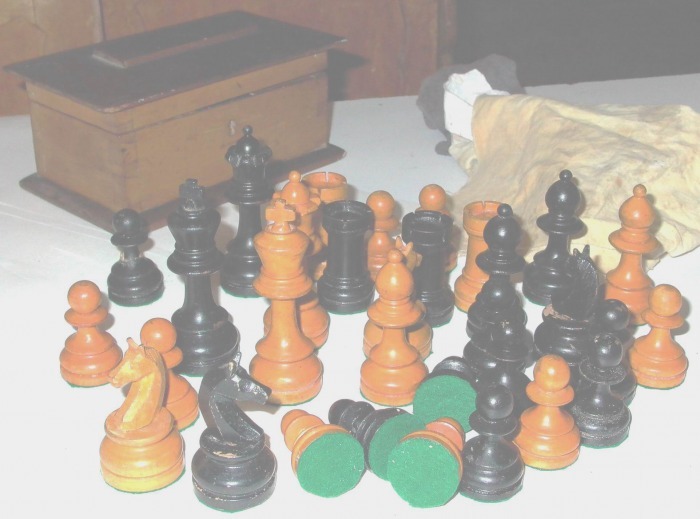 After leading it becomes a passable playing set! 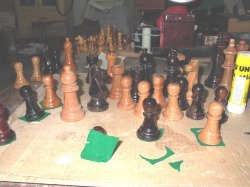 Felting is definitely useful to improve the handling of chess sets, especially tournament sets. It makes sense in order to protect veneer surfaces from scratches, to allow sliding movements of pieces, and to cushion their landing on delicate board surfaces, let alone hide the boreholes from leading. Nicest is natural felt made from wool - not thicker than 3 mm - but wool felt will be attacked by moths! There are quite good felts on fibre basis, and any reasonably soft cloth material will do as well - but felt is felt! 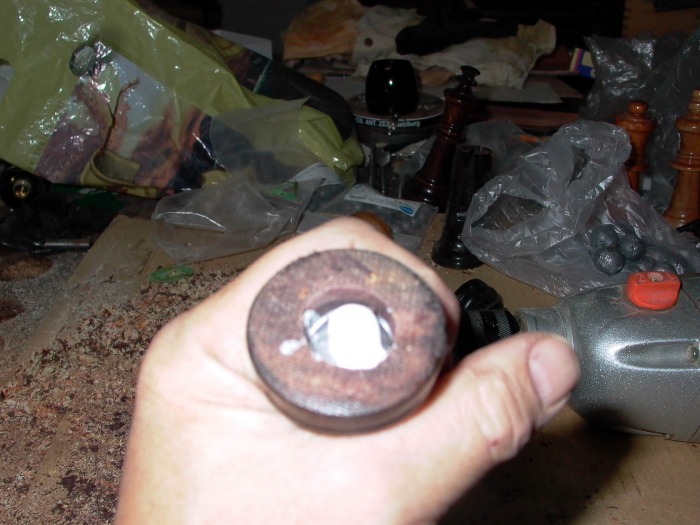 Stamping out circular pads with round forms and hammer on a wood base, is very tedious and slow. 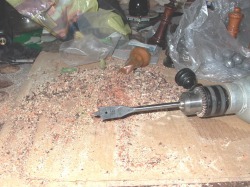 Besides, it is not easy to find these circular cutters in large enough sizes. Better use scissors or paper knifes. Use semi solid glue - You do not want to soak the pads as they then will harden and become scratchy - exactly what we do not want. 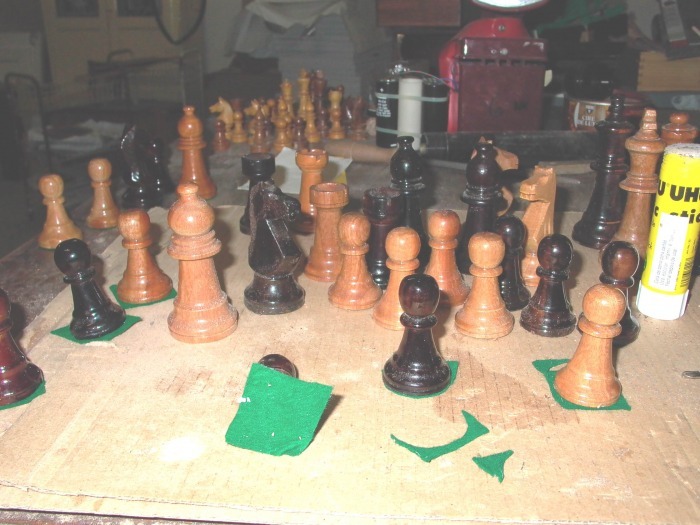 One might find self-adhesive paper or cloth pads in crafts shops - these usually are not thick and soft enough for our purpose, but will do to felt plastic chessmen. The recently loaded Indonesian set - I like to cut the felt into suitable squares aforehand. Observe the rest of felts and the glue stick - I then glue the pieces onto the felt squares and let them dry. When dry, I snip around the base carefully with a rough and small pair of scissors. The result looks satisfactory - the thicker the felt the less important is it whether the bottom of the pieces is really completely plane. Little corners from snipping on the pads are also secondary - worse would be cutting too close and snipping off wood splinters from the pieces! 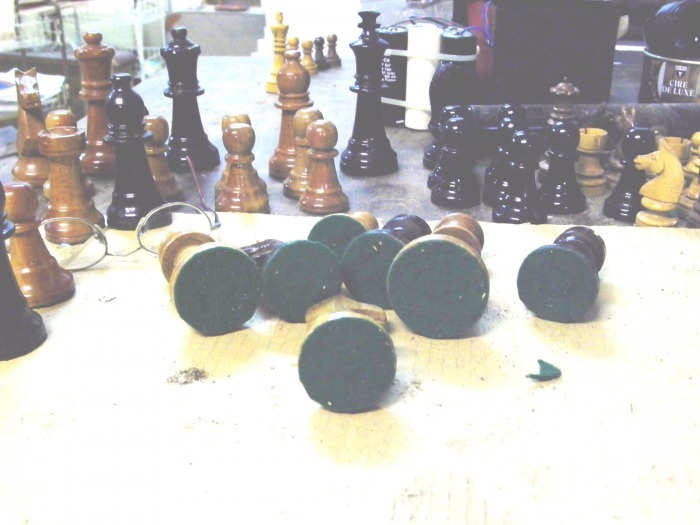 ... and in both cases, two drab and banal chess sets have been transformed into cracking tournament sets.